very often get just that !" Too much ducting with low headroom in main area of basement, very wide under-beam duct hump right at bottom of stairs, leaky return air and second floor rooms with little or no airflow. 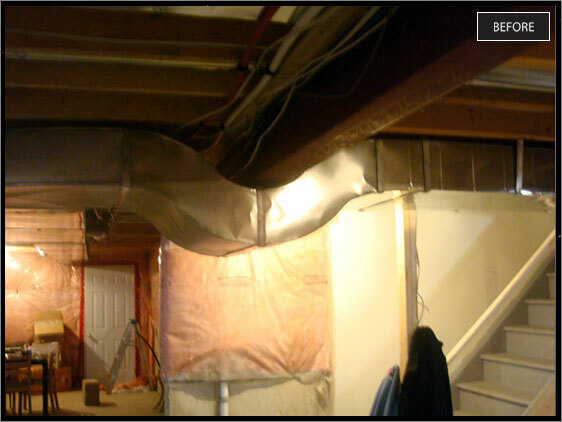 This space required an almost complete rebuild of the ductwork to relocate both supply and return air ducting to the furnace side of the I-beam resulting in a shorter and more efficient path for the air. Pictures 2 & 4 are taken from opposite ends and also show how we tucked the south end of the ducting tighter against the foundation wall. On all duct procedures, the entire system is checked from end to end, both supply and return, to make sure everything is properly connected and air-tight. A night and day difference, both functionally and appearance wise, when the space gets finished ! 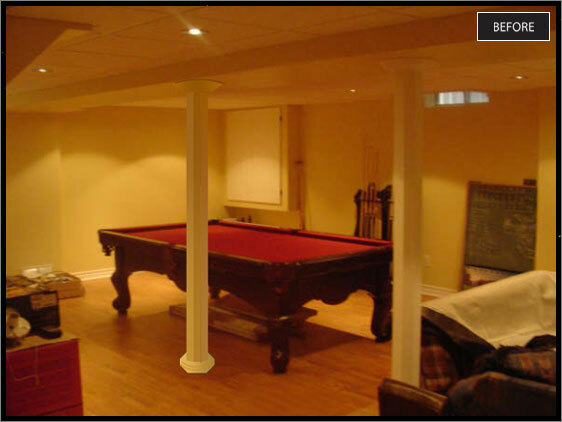 Column too close to pool table, basement 95% finished, contractor who does beautiful work still on site ! Praise contractor and supply coffee, donuts. accommodating to both the homeowner and myself. In a most timely manner, he took it all apart, let us do our thing and then built it all up again. When we (especially he) was done, it was as if the column was never there. He even managed to match the grain in a piece of flooring to fit the spot where the column was . . . amazing ! Pole in way of pool table. 6" I-beam above. This appeared to be a challenge at first as there was not a particularly long span involved but the beam was only a 6" tall I-beam rather than the somewhat more common 8". Considerable reinforcement was in order, especially without the loss of any additional headroom. Due to the basement floor plan dimensions, this pool table would not have fit, regardless of which way it was turned. Pole in way of main traffic area at bottom of stairs. 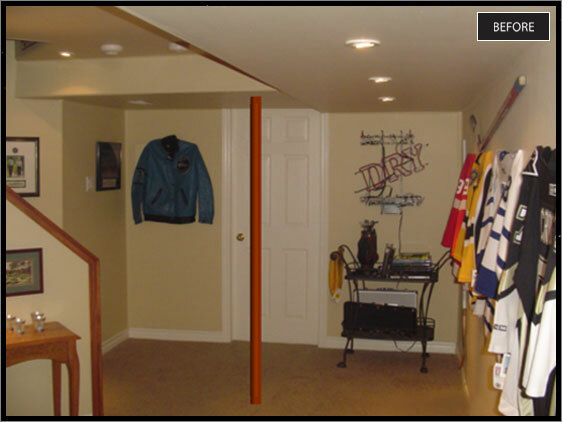 Awkward or impossible to bring large furniture into basement. Homeowner skeptical of avoidance by tipsy friends and guests. Believe it or not, the I-beam above was about 5' too short and didn't quite make it to the foundation wall on the left side ! The builder simply put a pole under the end of it and framed the remaining distance with a 3 pc. 2 X 8 header. Structurally OK but functionally awkward. Fortunately, after a few calls, we were able to locate a piece of the same beam section, spliced it on as an extension and re-installed the pole, tightly anchored against the foundation wall and hidden inside the finished wall.